Credit Issues? No problem. We Can Help. "After weeks of researching online and walking all the car lots in Fredericton looking for a new vehicle I found Fredericton KIA. I was very pleased with the service that I got the moment I walked on the lot. I highly recommend that if your looking for a new vehicle you check out Fredericton KIA. You won’t be disappointed." "New to Fredericton and have started using this store for our Sorento. So far so good. Pricing is competitive and staff is helpful. Gotta get me a Stinger!" "The team at KIA on Bishop Drive gives the best customer service in sales and service. We love or Rio and can’t wait for a second KIA to come in to our home. Gavin Brown is one of the best. You will not be disappointed with making KIA your first choice!" "Gavin was, from start to finish, positive, professional, knowledgeable, fair, patient with all my questions, and accessible. He always replied to our emails and phone calls promptly. He made the whole process of buying our new Kia easy and pleasant." At Fredericton Kia we truly appreciate your visit to our dealership. We have complete confidence in the quality of our Kia Vehicles and a total commitment to your satisfaction. We strive to provide you with the ultimate car buying and ownership experience. Driven to provide the best possible customer experience, customer feedback is reviewed regularly and work is constantly done to improve and keep up with your needs. At Kia Fredericton Kia new Kia vehicles can be found to suit everyone. Whether it's a sedan or a hatchback, a sport utility vehicle (SUV) or motorsport, a full range of Kia vehicles is available to you. The Kia Rio, Forte, Soul, Optima, Sorento, Sportage or the Sedona, they are all exceptional vehicles. Whether your priorities are the environment, fuel economy, comfort, storage or purchase prices, the Kia collection is right for you. Enjoy the qualities of a new car at the best price and exceptional after-sales service through Kia in Fredericton. Fredericton Kia also offers a wide selection of used vehicles for all budgets at the best price. The members of the Fredericton Kia team are here to help you find the vehicle that suits your needs and exceeds your expectations. Fredericton Kia offers an exceptional and personalized customer service in all departments. When purchasing a new or used car, or whether you are looking for maintenance for your car, for parts and services, or for credit or financing, you will be accompanied by skilled and professional people. Whether you opt for a new or used car, our advisors will inform you of available possibilities. Rest assured that your shopping experience at Fredericton Kia will be most enjoyable. Our commitment is to answer all your questions clearly and accurately. Our credit/financing department allows you to get a car loan at an attractive interest rate on new or used vehicles at the best price. At Fredericton Kia, enjoy a second chance at credit thanks to one of the highest acceptance rates. Come visit us at the dealership in a friendly atmosphere. See our new Kia models as well as our extensive range of used cars from various manufacturers. We offer compact cars, sport utility vehicles (SUVs), vans for families or sportier cars for enhanced driving pleasure. All our vehicles are inspected by trained technicians who ensure the quality of each unit. At Fredericton Kia, we want you to feel safe at the wheel of your new car. Do not hesitate to entrust your vehicle to Fredericton Kia's parts and service department. Our experts know the mechanics and body of your car and will take care of it meticulously. We will direct you to what is best to maximize the performance of your car and to enjoy it for a long time. Preventive vehicle maintenance can avoid some expensive damage to your car for a low cost. Fredericton Kia invites you to regularly visit its website. At any time, you may get in touch with a member of the team, apply for a price, schedule a test drive, make an appointment for service, ask questions, request financing (credit) and even purchase a car online! 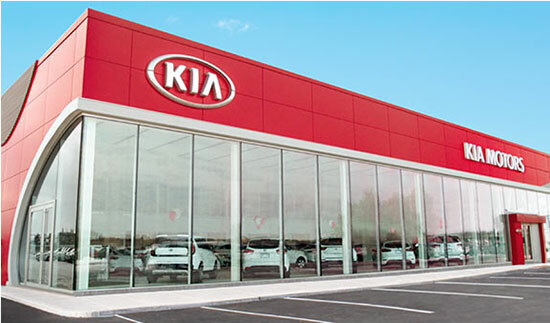 At Fredericton Kia we proudly sell and service new and used Kia to customers from Fredericton, New Brunswick, Oromocto, Woodstock, Grand Falls, Saint Stephen, Miramichi, Saint John, Moncton, Sussex, Perth-Andover and surrounding areas. Visit Fredericton Kia today at 433 Bishop Drive, Fredericton, New Brunswick, E3C 2M6, or give us a call at 506-455-2277. Fredericton Kia in Fredericton, New Brunswick.